Yet as much as this artwork simply joined in with the more general movements of Weimar's many visitors to the town - following them as they followed one another in their groups, drifting from monument to monument - it was also, I suspect, an artwork that attempted to make a type of `staged scene´ out of these pilgrim-like wanderings. I remember at the time of developing this work that my thoughts would often circle around certain questions – like how one might come to view and interact with the claims on culture when visiting a particular monument or place - or what it might mean when doing these things to both consume and in this process be consumed. 1. Title trans: 29. -31. Mai 2008, Weimar: Work to the promotion of the artist* in the age of the global economy. 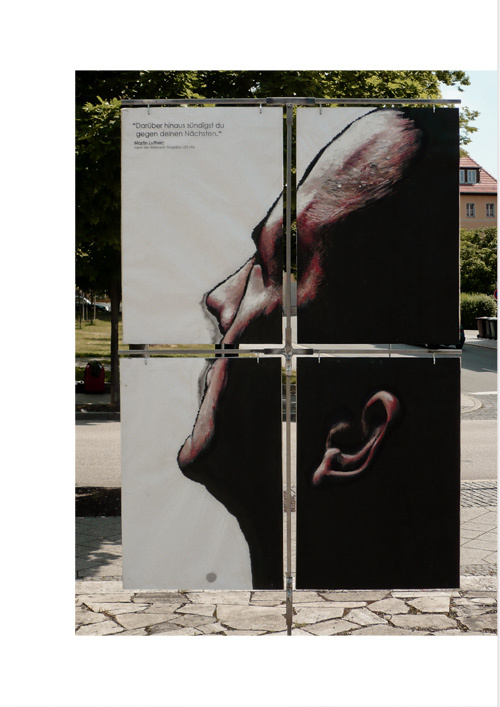 This temporary public intervention was presented within the conference "An Bord der Bauhaus" in Weimar, Germany.